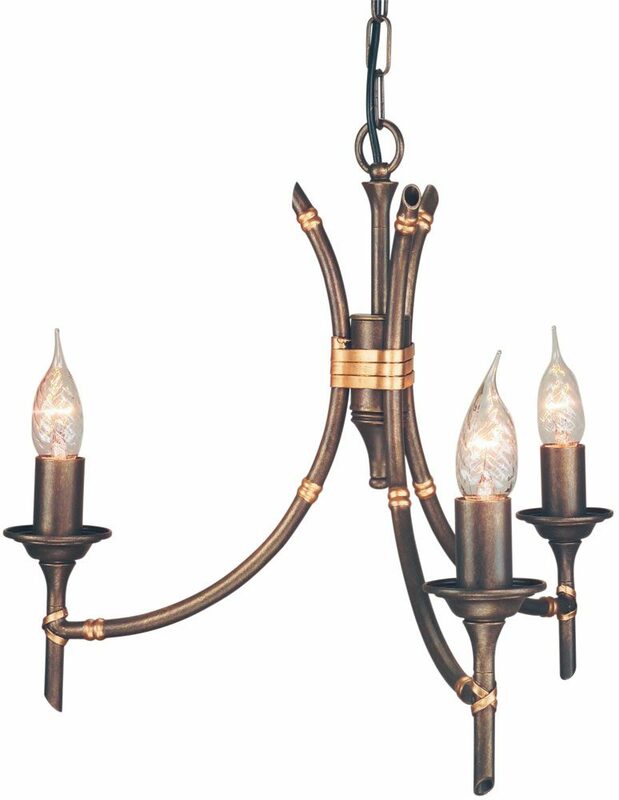 This Elstead Bamboo 3 light chandelier in bronze patina finish is handmade in England. Featuring circular ceiling cup ad chain suspension, with central rod and three curving arms resembling lengths of bamboo tied together with golden bark and candle style lights, fitted with metal candle pans and candle tubes. Can easily be converted to semi-flush using the supplied adapter for rooms with a low ceiling. Living up to its name, the Bamboo range is reminiscent of bamboo lengths neatly tied together with bark. All models will accept optional glass shades (GS153) if desired. Designed and manufactured in Britain by Elstead Lighting. Ideal for any living room, dining room or hallway ceiling. Height adjustable at the time of fitting by shortening the supplied chain or can be mounted semi-flush, please see the technical information below for dimensions. There are matching fittings available in the Bamboo bronze patina finish lighting range; please see below. This quality design is supplied by Elstead Lighting, a British company that specialise in the manufacture and distribution of quality decorative lighting such as the Bamboo 3 light chandelier in bronze patina finish you see here.